New Princess of Haifa greets you with warm welcome: Caesarea Breeze aka Caesarstone Moorland Fog Quartz Kitchen Countertops are marble like engineered stone. New Princess of Haifa greets you with warm welcome: Caesarea Breeze aka Caesarstone Moorland Fog Quartz Kitchen Countertops are marble like engineered stone. The unique design of Moorland Fog is pretty new in the market however, the look is very catchy. By comparing marble and other natural stones, for sure she is more durable with an elegant beauty. In terms of designer view: Very smooth pinkish beige surface carries the fine vanes and small twinkle style silver sparkles perfectly. The gray color of the veins changes from charcoal gray to graphite, graphite to soft gray. Likewise, brown color of the veins shows a variety from toffee brown to chocolate milk, which gives many inspirational kitchen remodeling options. Sparkles are the good bonus since most marble countertops don’t have them. As a little insert, the granite countertops are most known with their sparkles. In terms of consumer view: The most amazing feature of the natural stones is combined in this Caesarstone. Marble like engineered stone Moorland Fog with granite sparkles shows strong durability. 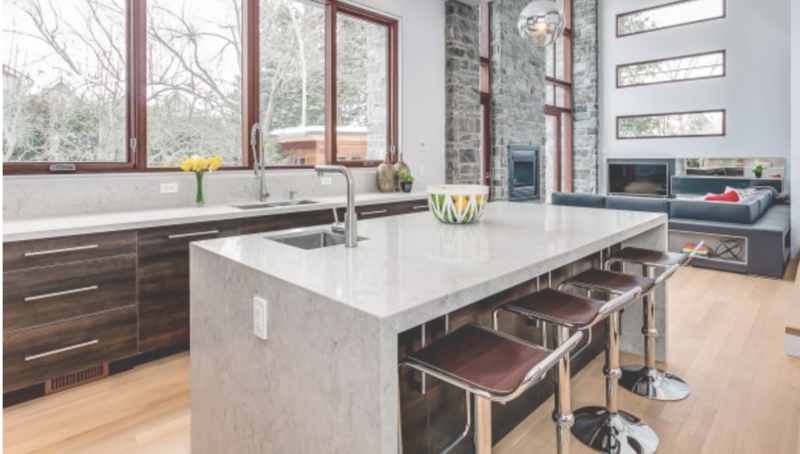 If you would like to look for the related stones to Moorland Fog 6046, I may suggest you Cambria Berwin which is more yellowish, Caesarstone Taj Royal 5212 has lighter surface and lighter color of veins. Caesarstone Snowy Cliff 6607, where you can find more dark grays on the surface and in the veins as well. Haifa Princess brings you Caesarea Breeze but unfortunately there is not enough picture of her. Beside her, Caesarstone Classico series has scarcely any pictures in real kitchen remodeling. I will keep my eyes open to find more picture for your visualizing of kitchen design ideas and I will keep updated my page as much as I can. 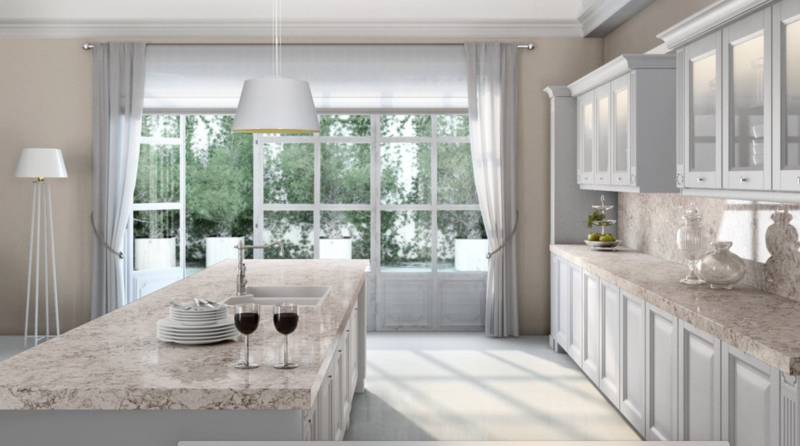 Below are the Caesarstone Moorland Fog Quartz Kitchen Countertops in Pictures. For my opinion, Moorland Fog goes very well with white kitchen ideas, two tone cabinets kitchen ideas, two tone countertops kitchen design ideas, dark cabinet kitchen ideas and gray kitchen ideas. Picture Credit: Caesarstone Canada Visualizer. Gray is new white in kitchen design ideas. 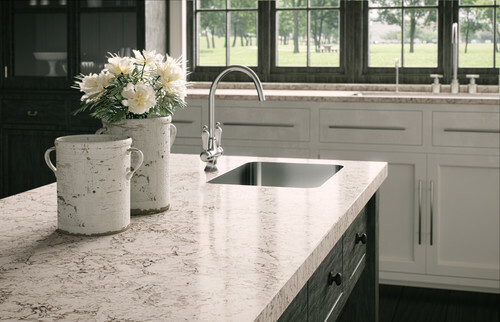 Moorland Fog Countertop is such a warm addition to the pale gray kitchen cabinets. Placing her as a full high backsplash, gives some extra shine to the kitchen. By having full high backsplash, Moorland Fog 6046 is now totally recognizable .I would like to recommend the countertop design idea visualizer for your next kitchen remodeling. Picture Credit: Avenue Design .Contemporary Kitchen design ideas are being less complicated by having Moorland Fog . Water fall edge Island top would not be express simply without Moorland Fog Island Top. Two tone countertop matches harmonically with dark base cabinets and light hardwood floor. The twinkle silver sparkles on the stone are the eye candies which can be seen with daylight . This kitchen is the best example to share and to fall in love with Moorland Fog. Hats off design. Picture Credit: Caesarstone Canada. Two tone cabinets are always difficult to pair with the countertop. This theory is not valid anymore: Caesarstone Moorland Fog makes all dreams true. Blending and inspirational beauty is diffusing into your veins where brings warm and homey feeling into your heart. Picture Credit: Galileo Construction Inc. via Houzz. Please take a look for a close caption of the engineered stone, then ready to mesmerize.